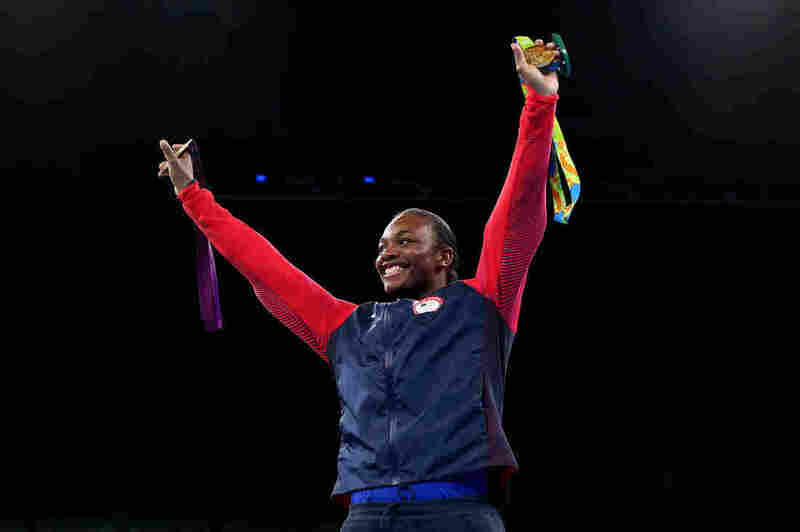 Olympic Gold Medal Boxer Claressa Shields Looks Ahead To What's Next After Second Gold : The Torch After her first Olympic gold medal in 2012, endorsements didn't follow. This time around, Shields isn't worried. "Everybody wants a tough, strong woman in their life!" she says. Boxer Claressa Shields holds her gold medals from the 2012 and 2016 Olympic Games during the medal ceremony on Sunday. She is the first U.S. boxer to win consecutive Olympic gold medals. Later, she explained, "People didn't give me my recognition for doing it one time. So I was like, you know what? When I get on the podium, I'm gonna put on both, so people will always remember and never forget that I'm the first American boxer to win two Olympic gold medals" in consecutive games. In the final match in Rio, Shields faced Nouchka Fontijn of the Netherlands. They'd met in the ring before: Just a few months ago, Shields had beaten Fontijn to win her second straight world championship in Astana, Kazakhstan. In Rio, just before the fight, Shields paced in her corner, coiled with energy, staring Fontijn down. She wore knee socks that said "Superman," with the superhero's shield peeking out over the top of her boxing shoes. And Shields proved invincible. Fontijn is taller, but Shields was faster and stronger. She slipped artfully under Fontijn's swings, bobbing her head and feinting. She pummeled Fontijn with sharp jabs and punches, taunting her at one point to bring it on. 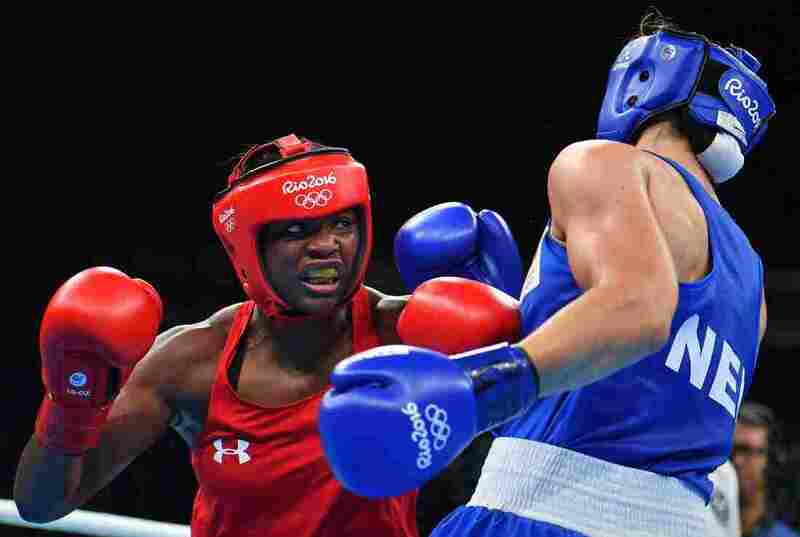 USA's Claressa Shields (left) fights against Netherlands' Nouchka Fontijn at the Rio 2016 Olympic Games. After the match, she recalled, "Coach Billy [Walsh] yelled out, 'Fake to the right, hit her with the right,' so fake right-right. Soon as he said it, not even a second later, I threw it and I knocked her across the ring!" In the end, after four rounds, the judges were unanimous and Shields knew it. She danced joyfully even before the referee raised her hand in victory. She dropped down on one knee in thanks and turned a cartwheel in the ring. Then she grabbed an American flag from her father, Clarence Shields, who was sitting ringside, and ran a victory lap around the arena, the flag flying behind her like a superhero's cape. Shields has come a long way from her tough childhood in Flint, and boxing has been her salvation. Her father was in prison until she was 9. Her mother was an alcoholic, and the kids would often go hungry. Shields has spoken about being sexually abused as a child. She reflected on that troubled past in a news conference right after her Olympic medal ceremony. "I have been through a lot in my life," she said, "but I want to inspire people, and I want to give people just a little bit of hope. Because I remember when I was one of those kids who didn't have any hope. And just when I got just a little bit, look how far I've been able to come!" When I spoke with Shields later, she admitted that the night before the final, she had a moment of panic. "I was like, 'Can you actually do this?'" she said. "It had me questioning myself for a minute, and then I was like, 'Of course you can.' I had to make that decision last night: if I had to out-bang her, had to out-box her, had to out-think her, I can do all three. So what's the problem?" Shields' record is now an astounding 77 wins, one loss. She will leave Rio with a $25,000 gold medal bonus from the U.S. Olympic Committee, and she has a plan: She won't be going back to live in the city of Flint, where crime rates are high and the economy is a shambles. "I still love my hometown, and I'm still gonna be involved in my hometown," she told me, "but I just can't live there." Instead, she said, "Florida will be where I live. Every time I go to Florida, I have this overwhelming feeling that I'm happy every day. I wake up in the morning wanting to train and run at 3, 4 o'clock in the morning, every day. I can get out and do that and be safe doing it." When Shields went home from the London Olympics four years ago, even though she was a gold medal champion, endorsements didn't follow. There was no Wheaties box. No deal with Nike. She was advised to stop boasting about how she likes to beat people up. 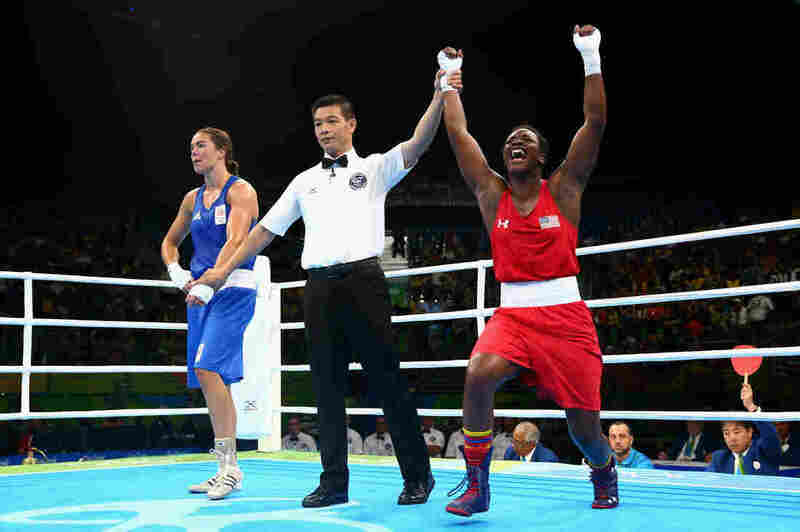 Claressa Shields of the United States (right) celebrates victory over Nouchka Fontijn of the Netherlands on Sunday. "They had this weird definition of what a strong woman was. For some reason, that definition was pretty, non-sweaty and not as muscular. And one, I'm very pretty. I think I'm fine! I'm gorgeous!" she told me with a grin. "But the fact of it is," she continued, "when [I'm] boxing, I look so strong and I'm punching so hard and I'm punching so fast, and [I] make people feel intimidated. I think that now people are starting to embrace that. The definition of a strong woman is Laila Ali. Lucia Rijker. Serena Williams. Claressa Shields." She's not worried about getting endorsements this time around, "cause everybody wants a tough, strong woman in their life!" Boxing promoters were watching this strong woman here in Rio. It's possible they'll make her an offer to turn pro. Universal Pictures has bought the rights to make a feature film based on her life story. "Hopefully, I'm a household name now," Shields said, "which I don't doubt!" Right now, the two-time Olympic champion wants to go home to Flint to see her family. Then she'll get back in the ring to start training for whatever comes next.